Tired of searching for that perfect table fabric that can blend contemporary styling with ease of functionality? Well, your search ends here with the sophisticated Lace Table Overlays—the perfect solution for the sensible host like you! The Tulle satin table fabric is designed passionately to give your table ensemble a blissful look. The overlays comes in four classic yet amazing design, offering you an option to choose the kind of bliss that you want to instill in the ambience. The design variants include marvelous flowery pattern, sequins pattern and lace pattern. Draping your table countertop with these table fabrics is sure to give your venue a touch of paradise. 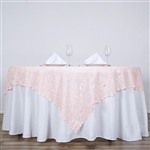 Get one of these Lace Table Overlays and share a blissful time with your guests at your event. With this table linen, you can beautify any event you want to host, be it a wedding ceremony, birthday celebration, prom or so. We take orders for these table fabrics, helping you to recreate your own paradise.